Si vous êtes à la recherche d'un équilibre, l'harmonie, la vie privée et la position pour profiter, vous êtes au bon endroit. Ici, vous serez assez proche pour pouvoir visiter Dubrovnik, Cavtat et région de Konavle. Situé dans la région idyllique et paisible Konavle, dans Dubravka, un petit village 40 km de route de l'ancienne ville de Dubrovnik. Cette maison offre tout ce que vous désirez pour des vacances rajeunissant sur la côte dalmate Sud. Riche en culture, célèbre pour ses écrans de couleur locale et de folklore, Konavle est également connu pour ses vallées de la campagne naturelles et de collines verdoyantes, édifices rocheux, et en effet, l'hospitalité du pays! L'aéroport de Dubrovnik est situé à seulement 15 minutes, et «Gruda", le supermarché le plus proche est à seulement 6 km de cette maison. Juste à 6km se trouve le restaurant traditionnel renommé Konavoski Dvori. Molunat 12 km au sud de Cavtat et à 15 km de Villa Betty, est le foyer de plages immaculées, et une sélection de restaurants et de bars. Juste un autre à 5 km de Molunat, est la frontière du Monténégro. Dehors: Une maison spacieuse avec un jardin dans Konavle est idéal pour les familles souhaitant échapper à la vie quotidienne, et ont tout le confort nécessaire. Il est équipé d'un mobilier moderne et possède une belle terrasse, qui est reliée à la piscine de loisirs où vous allez certainement passer la plupart du temps. Piscine est 25m2, spécialement conçu pour les enfants et l'accessibilité des personnes âgées. La piscine est entièrement privé. Sur la terrasse vous trouverez un barbecue et meubles de jardin moderne où vous pouvez passer le barbecue de temps, en sirotant du vin local ou la lecture d'un livre favori sur les salons. La maison est située dans une nature intacte de cette belle région, et offre une vue magnifique sur le paysage. Service de nettoyage / serviettes / / Femme de ménage: Tout Inclus dans le prix. Changement de draps et serviettes dépend des préférences des clients. Robert and Yvonne make Villa Betty a home away from home. The house is ideal for a small family with all the usual mod cons, plus a lovely pool. Set in the Konavle region, there are a number of vineyards and olive oil tastings to visit. Robert recommended a great restaurant, Konoba Monkovic, by the river, that served great local cuisine - and the tastiest potatoes I have ever had! There were plenty of food shops and many towns and activities within an easy drive. We drove to Srebreno where we parked for free and got the boat in to Dubrovnik and to Lokrum Island. This was our first visit to Croatia and Robert and Yvonne made it relaxing and comfortable. As a concierge, there isn’t anything he doesn’t know about the local area. My wife, 2 year old daughter and myself had a lovely relaxing holiday at Villas Betty. Its in a beautiful setting nestled between a small number of residential houses and small holdings, very peaceful and picturesque. Although a little off the beaten track (which is what we enjoyed) there are plenty of places to visit and eat nearby. If you need any advise or even a restaurant booking, Robert the owner is brilliant, being a concierge at a major hotel in Dubrovnik he really is attentive and informative. There are plenty of restaurants we haven't visited but of those we did, Kameni Dvori was excellent. Robert organised for the restaurant to pick us up so we could sample the wine and drop us back off at the villa. The family at the restaurant were really welcoming the setting is beautiful. All their food is locally sourced (if not produced on there land) and cooked traditionally. There is a new roofed area at the end of the garden of the villa which has been well built with local stone and traditional roof tiles which is a great addition to the outdoor area. There's a traditional chimney style BBQ and I believe in the future there will be an outdoor sink, hotplate and toilet facilities. The rooms are of a good size, furnished modernly and the kitchen is well equipped with everything you need for a good stay. The pool is a good size, a little chilly for a 2 year old but we had taken a little paddling pool so that solved that one. You definitely need a car but the roads are great and there's very little traffic in the immediate area. If you want to pop across to Montenegro then you're no distance from the boarder crossing but don't forget to advise your car hire company as you will require to pay some additional insurance for the trip. p.s. turn your data roaming off on your phone if you cross the boarder as it will cost you if you don't. We loved the landscape with the steep wooded hillsides and Cyprus trees, so pretty. The coastline is also beautiful with clear blue sea. Its the first time we've been to Croatia and we have very much enjoyed our stay. It was made even more relaxing as we new we had Robert at the other end of a quick text if we had any concerns or questions. We were lucky to meet Roberts wife and son and felt extremely welcome in their company. All in all we had a great break and would love to go back. A nice house in a really lovely rural area. Great things to see and do, eat and drink. Strong “yes”. This is in a quiet, unspoiled rural area of great beauty, 20 miles from Dubrovnik, 20 minutes from lovely Cavtat. There are excellent places to eat. Local wines are international class. House has a great pool. Perfect for country walks and, in late April, fabulous wild flowers. Not a place for night life. Weather was near perfect for a week in late April. Hosts are very helpful but not obtrusive in any way. A delightfully renovated villa, beautifully decorated and in a super location. Villa Betty is easily as good as the description on the website. Robert (the owner) and his lovely wife were attentive and couldn't have been more helpful, even making restaurant reservations for us. 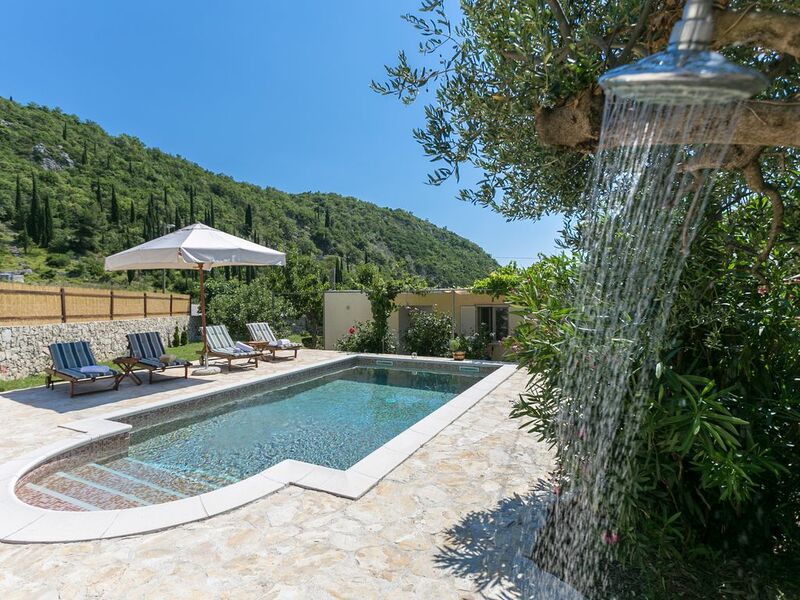 The villa has everything you need and is well placed for trips to Dubrovnik and Cavtat (both are a must). It is equally as tempting to sit by the private pool and admire the dramatic scenery that circles the villa, you can even see the sea! It is not often that a villa ticks all the boxes, this one certainly does. Thanks for everything, you both deserve great praise for creating this brilliant villa. Good luck with your future plans, they sound very exciting. We had never been to Croatia before and Villa Betty was the perfect base to explore this beautiful country. We had the most wonderful holiday with our two teenagers and the villa had everything we needed for our stay. It is modern with all mod cons and the wifi kept the kids happy. The villa is located in the beautiful hills not far from Dubrovnik and Robert and his wife were very helpful providing us with information on where to go and what to do. There is so much to see and do and when we weren't exploring, lounging round the pool was the perfect way to relax. We thoroughly enjoyed Dubronik and Cavtat but also explored lots of other towns with beaches. We loved snorkelling in the crystal clear waters. The villa is situated close to Montenegro and Bosnia and we drove to both countries easily. I cannot recommend Villa Betty enough. A beautiful property, in a lovely setting. Ideal for a relaxing holiday. The villa is very clean with everything you need. The location is very quiet and out of the way, but not to far from the nearest village. Robert and his wife are excellent hosts and are always on hand if you need anything. Beach est à 15 km. Location de voiture est recommandée. Propriétaire fera un plaisir de vous aider à louer.